Last week's oddest announcement, Angry Birds Epic has now soft launched in Australia and Canada, giving players pretending to be in those countries a chance to find out just what the hell is going on. Let's take a look. If they wouldn't have been sued out of existence, Rovio should have called this game Angry Birds Saga. The game takes place on the same sort of progressive map as King's Saga games, encounters represented by circular icons. 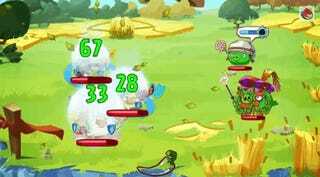 The Angry Birds franchise is known for delivering easy-to-digest snippets of gameplay, and Angry Birds Epic follows suit. Each encounter is a single battle between birds and pigs. There are dungeons, in which players must take on a series of battles before reaching their ultimate goal, but for the most part it's one encounter at a time. The combat screen is simple and uncluttered — I find it rather elegant. Just the opposing forces, health bars, and a phantom chili that fills up as your champions due battle, allowing them to unleash powerful skills. Your first character is the Knight. He hits things with weapons, but also has the ability to protect himself and other party members from damage. To attack, the player drags a line from the character to its target. Using a special ability is just a tap. Again, simple and elegant. Defeat your enemies and you'll be graded via Rovio's regular three-star system, with a bit a of a twist. The more stars you get, the more loot you receive. Loot is used to craft weapons and potions, both of which are incredibly handy. The battle system really shines once you start amassing more party members. Each character class can use their special abilities on other members of the party to enhance battle effectiveness. For example, Chuck here can use his ability to create a lightning-based damage shield around the Knight. The Knight can use his ability to shield Chuck, reducing the damage he takes as he blasts away at their foes. Hat-based character classes? That's the sort of thing that keeps me playing. I cannot stop until each of those slots is filled for every bird in my party. Stupid hats. Angry Birds Epic is not at all what I expected, but I am really enjoying what it is so far. Mind you this is soft launch, and the game could change between now and when North Americans can play it without making a fake Australian iTunes account, but so far it's living up to its name.